Turns out it’s not only Belfast that has a tendency towards sheepish public art. In the shadow of St Paul’s Cathedral in Paternoster Square stands a cast bronze sculpture, sitting on a stone plinth just outside the Starbucks that frequently provides my breakfast! Elisabeth Frink created the sculpture back in 1975. And when Paternoster Square was redeveloper, the artwork was reinstated in 2003. So the back story is that Northern Ireland had a football team who had a manager called Lawrie Sanchez, who was offered a part time job at the end of the season, did well, decided he preferred the new job, gave up the old one, and left the NI team without a leader. And the news is that, tomorrow, the Irish Football Association will announce that Nigel Worthington will be the new NI manager. How do I know? Well he was on the bmi flight home tonight from Heathrow along with IFA president Jim Boyce, and there was a mini-media scrum waiting to capture his picture as soon as he picked up his bags from the carousel. CORRECTION: With typical blogger-accuracy, turns out that although Jim Boyce was indeed on the bmi flight, Nigel Worthington came in separately via Belfast International! The IFA website says that the announcement will be made in the Dublin Suite of the Europa Hotel at 12.30pm. Or you can read it here on Alan in Belfast. If only I’d known who Nigel was I could have got a comment from him while we were on the flight. But being a football ignoramus, I was quite pleased that I’d managed to recognise Jim Boyce! And in hindsight, he wasn't there to recognise! 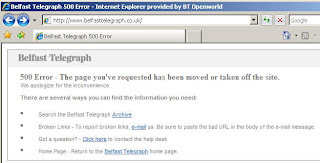 Last year Alan in Belfast managed to stay reasonably Big Brother free. This year will try and follow the same pattern. But I’ll slip in a few quick comments before we start. The show is an important part of Channel 4’s year. It’s commercially lucrative—though less so this year since they have decided to half the price of the voting lines, and removed text voting altogether. It also provides an important surge of viewers, helping with its reach and share statistics for the 12 weeks (yes, that’s nearly a whole three months) that the show airs. After the furore over Celebrity Big Brother in the new year, Virgin Media have taken over the sponsorship of the show, initially for this summer’s series with an option to renew. So the quirky bumper ads on the way in and out of the programmes will feature clips of contestants from other BB houses around the world, with spoof subtitles used to promote Virgin Media’s services. So starting at 9pm tonight, the BB Zoo will open its turnstiles and fill up its cages with another menagerie of animals. Expect the weird and the very weird. But also expect a tamer environment. Early reports suggest a member of the Women’s Institute (a pretty diverse organisation), a nanny and three people who’ve never been on a plane). With an increased level of scrutiny and compliance checking, will Brighter Pictures (part of the Endemol UK group) opt to let the personalities provide the entertainment and drama, rather than forcing them into unusual tasks etc. The original series of UK BB caught viewers’ imaginations, yet wasn’t terribly sophisticated. Nasty Nick didn’t need to be created or cajoled into acting. Though if you put a bath in the living room and leave the fridge outside in the garden, you don’t need much else to stir up a story line or two! According to this morning’s London Metro free paper, Ladbrokes are offering odds of 50/1 for BB being taken off air before the end of the series! Well the 2007 Satin Pajama Awards are over and the organisers can now roll up their pajamas and hide them under their pillows until next year. So how did AiB’s favoured blogs and bloggers do? Our Man in Tirana came a healthy third in both the Best Expatriate and Southeastern Europe blog categories. Petite Anglaise was voted the Overall Best European blog with a massive 56% of the vote. Slugger O’Toole came fourth with 7%. So it was back to the Belfast Children’s Festival this morning. First call over at the Old Museum Arts Centre for a spot of reading at Tea and Tales. The tales came from the stacks of books piled up on the central table, surrounded by bean bags and comfy sofas. The tea came from the reasonably priced coffee bar. Then it was over to the Waterfront Hall to write a Love Letter ... children choose the object of their affection, use a stencil to paint on a capital letter, draw their object, and wander the three floors of the Waterfront to find the correct tent to stick it up in. Outside, in a diminutive theatre holding only ten people, Cahoots NI were presenting The Flea Pit, featuring their performing fleas with their incredible feats of mind reading, weightlifting and incredible trapeze stunts! We didn’t sign up, but it was photogenic and it looked like great fun. And finally, we made spiders at the Animal Sculpture Workshop. Quick-setting modelling putty, straws, pipe-cleaners and lots of paint. Did I mention lots of paint? So thick was it plastered on that one of our spiders is still drying out. Some of the events carry on through the week. Check out the festival events programme. Months ago I posted about the problems I found trying to get a SatNav that worked adequately across the island of Ireland. Rather than bear the expense of a Garman unit, I opted for the TomTom One Europe – which uses Navteq maps, rather than the different map supplier (Tele Atlas) than similarly-named models like the Tom Tom One GB. A story caught my eye in the free Metro paper on the Tube, and it was reprised on the BBC News site too. Stijn Ulenaers and his girlfriend Gudrun Vanlaar drive around Europe in an Orange Tele Atlas motorhome, kitted out with five cameras, a hard disc recorder, and a map that looks a bit like a snail trail showing which roads they’ve driven along and which ones they still need to traverse. Maybe, having been part of Tele Atlas’ major press offensive, the pair will manage to pop across to Ireland soon and spend a week or two adding a lot of detail to the Tele Atlas maps. (And Navteq shouldn’t shirk from coming back to catch up on their mistakes – like the non-existent right turn across the Albertbridge Road opposite the old Maysfield Leisure Centre (now Titanic Film Studios). Today, as well as the Lord Mayor’s Carnival processing around Belfast city centre, the Belfast Children’s Festival is getting into full swing. The Waterfront Hall was full young kids enjoying paints, hat making, and sticking love letters appropriately labelled tents. ... while even the sheep outside entered into the spirit of the event! Lots more events over the long bank holiday weekend, with a few stretching into next week too. I recently caught the first of the Mark Kermode & Simon Mayo movie review vodcasts, the video version of the normal Friday afternoon movie podcast. Or in the old fashioned world, the show you can catch on your steam-powered transistor radio if you tune it to 909 kHz on its medium wave dial. Mixing between the existing static Five Live studio webcams, and stills of the featured films’ posters. It’s a bit heavily edited, with much too frequent cutting between camera angles for my liking. The upside was seeing Mark Kermode waving his arms about as he ranted and raved. The first show has now expired from the vodcast feed, though it has been preserved over at YouTube. Another film podcast worth checking out is the Jett and Dr Higgins’ show – Film Talk – though it isn’t release quite as regularly as the weekly Kermode one. 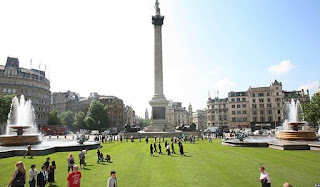 Trafalgar Square stunt watch update! I continue to be amazed at the variety of events and stunts that are held in and around London’s Trafalgar Square. I’ve witnessed a couple of the recent ones: the Spamalot World’s Largest Coconut Orchestra record attempt and Channel 4’s 74,802 mugs of tea extravaganza for The Human Footprint programme. On Tuesday night, BBC Two’s gadfly documentary Power to the People invaded the square and erected a new status as part of “one last daring operation” by “a specially formed platoon of former soldiers, who believe they have been cast aside after fighting for Britain”. 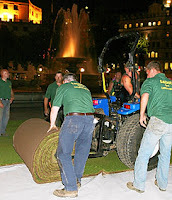 And now Visit London have covered the paving with two thousand square metres of green turf, converting the square into a village green to promote their Village London campaign. Just for two days - Thursday and Friday! “During the two-day event people will be able to take advantage of the green space to have a picnic or just soak up the atmosphere and relax in a deck chair. The existing Café on the Square “will be offering Pimms and special picnic boxes with sandwiches, fruit and cake to take away and eat on the grass” while the nearby Trafalgar Hilton Hotel “will be selling luxury picnic hampers including treats like salmon and cream cheese bagels, salads, a selection of cheeses, chocolate brownies and fresh strawberries”. Yummy. And it was obviously quite a late night while the turf was laid. What will be the next stunt? I have a new favourite blog. Supersimbo and Cherrysimbo (Ally and Cherith) got married at the end of March. 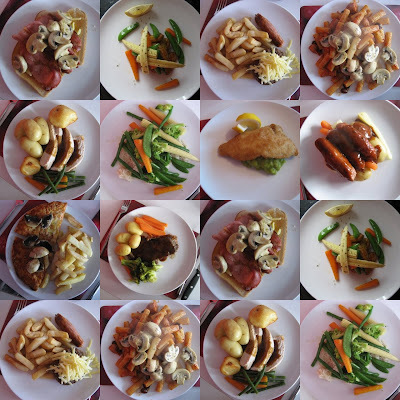 As well as his normal personal blog, Supersimbo is also publishing Our Meals, showing a picture of each night’s dinner. Got to say that I’m impressed with the standard of presentation, not to mention how good the food looks! Reminds me a bit of the man who kept a log of every meal he ate for the best part of his life. Every ingredient used was noted down. Can’t remember his name, and Google isn’t helping find it. Drop me a comment if you remember his name or details. Are there really so many blog awards that they’ve run out of sensible names? Well, it’s now the turn of The Third Annual Satin Pajama Awards which celebrate “the best of the European blogosphere”. Long-time holder of a coveted(!) place in the AiB blogroll is Our Man in Tirana, written by a Belfast man now living in Albania’s capital. If you like what you see why not give him your vote in the Best Weblog about Southeastern Europe and Best Expatriate Weblog categories? 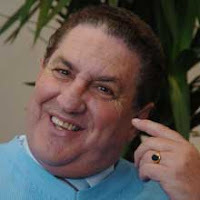 You’ll also find the local political blog Slugger O’Toole short-listed in the Best Political Weblog and Overall Best European Weblog categories. And Mick Fealty (the man behind the team at Slugger) is up for a The 2007 Satin Pajama for Lifetime Achievement award too. Vote early ... but not too often. And today there has been a tangible consequence of their BHAG, with a pilot running in Northern Ireland. From 1 July, shoppers in NI M&S stores will pay 5p for plastic bags they pick up at the till. Shock, horror! Waving hands in disbelief! But not so scandalous if you’ve been along to shop in LIDL or been shopping in Euros in other parts of the island. And to help, M&S shoppers during June will be able to “receive a set of three brand new ‘Bag for Life’ carrier bags designed by illustrator David Downton”, similar to Sainsbury’s giveaway of stronger bags at tills earlier this month. And the profit from the sale of the bags will be donated to Groundwork Northern Ireland, a local charity working on environmental regeneration projects in disadvantaged areas. Turned down sheets, chocolate on pillow ... and a weather forecast? It’s quite rare to stay in a hotel that still comes into your room to turn down the sheets in the evening and leave a chocolate on your pillow. But even rarer is a hotel that also leaves you the weather forecast for the morning! But if that’s the kind of service you desire, can I recommend the Crowne Plaza at Dublin Airport - just next door to the (cheaper) Express by Holiday Inn hotel. And their weather forecast was pretty accurate. What a difference a month makes! Back in April it was still slightly dark as the red-eye to Heathrow took off from Belfast, and there was a glorious sunrise across the skies. After a week of travelling no further than my desk in Belfast, it’s back on the road this morning, heading over to London. Now it’s May and it’s already daylight outside when the alarm goes off at 05:15. Mind you, it wasn’t helped by the 06:30 flight taking off 45 minutes late at 07:15, and landing at 08:30—a full 50 minutes shy of the scheduled 07:40 arrival. 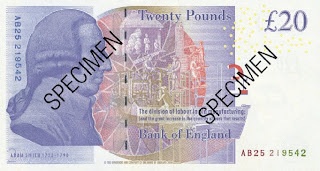 Nearly more disturbing, someone at the Bank of England has been playing with the desktop publishing package, and has redesigned the twenty pound note. Now with a working bank card—unlike a couple of weeks ago—I tried to get some “English money” out of the hole in the wall at the airport. Why does the ATM bother offering amounts like £10 and £50 on-screen when the machine already knows that there aren’t any ten pound notes left inside? 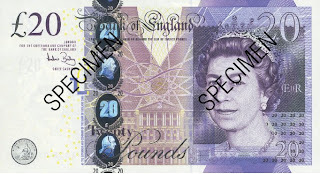 Then the twenty pound note came out. I wondered at first if it was a fake! It’s got lots of white space in a thick margin ... very Web 2.0? But with a drawing of economist Adam Smith on the back, it seems genuine enough. And the Bank of England seem proud of all its security and anti-fraud features. Neighbours – the first episode – I remember it! It must have been school half term, the week-long Halloween holidays. 27 October 1986. As a teenager, watching television that lunchtime, a new show came on after the BBC’s 1 o’clock news. An Australian drama. I can still remember parts of the plot. Des was getting married the next day. It was his stag night, and the lads had invited a stripper to the party. BBC 1 in the early afternoon! Next day his fiancée calls off the wedding. But Daphne the stripper comes back to the house to find her watch which she’d left behind the night before. There’s a “I didn’t recognise you with your clothes on” moment from a nicely innocent Des. But why does the fiancée’s father recognise Daphne? Later on in the week, and in need of another income to cover the rent, Daphne the stripper moves in to Des’ house. And it turned out it was the first episode of an exceedingly long-running soap, that when the current contract runs out next year will be moving to the screens of Five in Spring 2008 to join the old ITV stalwart Home and Away. I stopped watching Neighbours shortly after it started, but anyone in Northern Ireland struggling with poor analogue Five coverage and with no access to Freeview may want to try catching the daily 5.30pm episodes on RTE Two! Dans Paris (In Paris) ... in a cinema near you! On reflection, the film Dans Paris could have been titled Dans Anywhere. Other than the opportunity to plant familiar Paris landmarks in the background of many scenes (there was an Amélie feel to some shots with the Eiffel Tower over the shoulder of the actor) the story could have been set in any European city. There’s a family. Estranged parents, two brothers (Jonathan and Paul) and a sister Claire (who committed suicide aged 17) some years ago. It’s a French film, so don’t expect too much laughter and too many happy endings! The film starts unusually, with an introductory piece to camera by Jonathan. Narration is often seen as a sign of weakness in cinema, a failure of the screenwriter to get the story started, or to tell the whole story on-screen. In the case of Dans Paris, we should be grateful that they used this device to jump start the story, otherwise the film might never have got out of bed and gone beyond the first reel! There’s plenty of messing with the timeline, with frequent cuts in the film’s opening twenty minutes to scenes a couple of weeks before the main action, with few clues or cues. The two sing-alongs ... I kid you not ... are woeful. Two characters, on the phone to each other, singing a duet. The performances would sit happily at the bottom of the Eurovision Song Contest result table. Also watch out for the ministry of silly walks demonstrated by Jonathan. Dans Paris deals with depression, and a family facing up to the truth about their lives and their circumstances. They don’t talk a lot about their feelings and problems. Paul’s darkness of spirit is contrasted to brother Jonathan’s lightness and joie de vivre. The father can be both loving and disapproving. Yet over the course of the day we spend with the family unit, they start to open up. It’s not a poor film, but it’s hard to recommend. (Though it is an excuse to post a picture I took back in March 2003 from the top of the Eiffel Tower!) 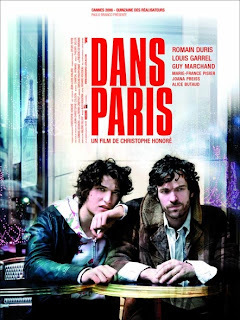 If you find yourself loitering on University Square between Saturday 9 and Thursday 14 June and it starts to rain, pop into the Queen’s Film Theatre and you’ll catch Dans Paris rather than a cold! Imagine a ball game amalgam blending together wrestling, clown and synchronised swimming. Last night it was on show at the Odyssey Arena. The Harlem Globetrotters UK tour kicked off last night in Belfast. Regular readers of AiB will know that I’m not a sports fanatic, so something had to induce me back to a second basketball match. bmi occasionally run events for gold card holders. Previously they’ve taken frequent flyers to Castleward Opera, sit down dinners, Salsa dancing. But this year they were overwhelmed by the response to their invitation to a night at the Odyssey with tasty tapas in the first floor La Tasca before heading down to see the game. The Harlem Globetrotters were playing the New York Nationals (though they’re a stooge team and pretty inconsequential, spending lots of time running with their arms pointing down to the ground in case they’d interfere with where the ball is meant to be heading). The Globetrotters won. But no one was keeping score, or watching the clock too closely. In fact, no one was overly worried about making sure there was enough dribbling between steps. Young kids loved it. Lots of local primary school-aged basketball teams were there, dressed up in their kits. A young player, David, amazed the crowd with basket after basket during his one minute of fame during half time. After an unsettled start when they didn’t look like they knew where to stand or what to do when the players came on stage court (first night blues), the Pulse Cheerleaders from Essex performed their two dance routines with energy. The real highlight of the night was the Big G, the Harlem Globetrotters’ mascot. (Check out the preview clip to see what he can get up to, though discard the more athletic basketball stunts which aren’t part of the UK tour.) His movements were funny, and his upside down bouncing a high spot of the night. At the start I mentioning clowns. Much of the humour of the night is playground stuff—probably why it appeals to kids so much. Lots of faux arguing with the referee. Playing while carrying an audience member’s handbag, effeminate movements, mincing across the court, players asserting that “I’m a big man” (as opposed to a handbag-carrying big man) all felt inappropriate and didn’t get a great response from much of the Belfast crowd. Doubt they’ll get any warmer a reception in Glasgow tonight. But as a freebie, it was a good night out. In comparission with a real NBA match, the atmosphere was lacking (the crowd never stood and cheered despite repeated attempts by the organisers to whip up enthusiasm), the lighting was poorer and you missed the big screens for action replays and close-ups. Today would be a good day to refer back to a late November post - which included a picture of the ornate front door of the London HQ of the Church of Scientology. You can read about the Panorama programme at lots of other websites - I’m not going to make any comment here for or against the programme (or the church). 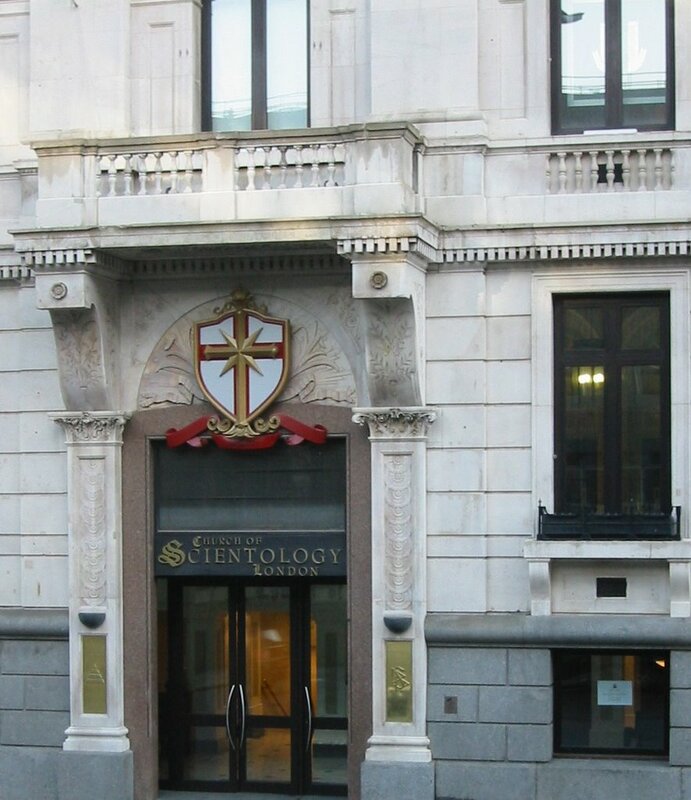 The founder of the Church of Scientology was L. Ron Hubbard. As a teenager, I read through Hubbard’s Mission Earth series of books one summer. The local library had about half of the ten-part series in stock, and the rest were ordered in from neighbouring branches. It’s really one single story split over ten books (each two inches thick) to save people having to reinforce their bedside tables, never mind their beds, to read it! My memory of the plot was that it’s pretty mediocre sci-fi, told in an overly verbose manner, with some wierd passages in the middle of political intrigue and not quite enough space stuff. At 1.2 million words long, it’s double the length of Tolstoy’s War and Peace, which I started one Christmas and didn’t finish. In the world of books, plot and characters matter more than size. Mission Earth isn’t a novel I’ll be re-reading anytime soon - or recommending to anyone else. Now here’s a story frequent flyers don’t want read over breakfast! BBC News this morning reports that the early morning Flybe flight from Belfast City Airport to Cardiff has been delayed due to flooding! “A flight between Belfast City Airport and Cardiff has been delayed amid fears water from catering containers may have damaged wiring. About 50 passengers due to fly out on the 0705 Flybe flight have been moved off the plane after catering containers were overfilled with water. Domestic staff have spent an hour mopping the carpet.